We recently told you about a great nationwide promotion from our friends at Volvik Golf. 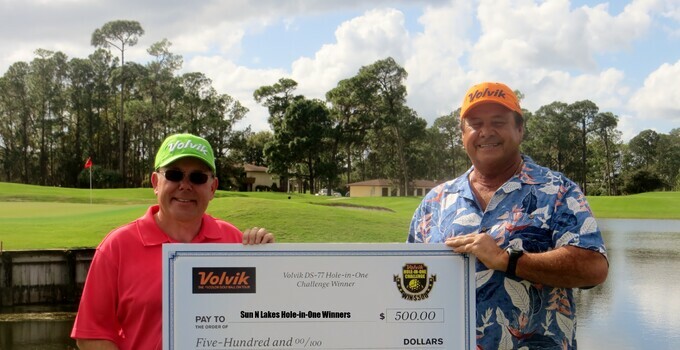 They call it the Volvik Hole-in-One Challenge, and the idea is simple: Register online at Volvik's website, and, if you make a certified ace using their DS-77 golf ball, then you win $500. Sweet! Joe Bowditch, a player at Sun 'N Lake Golf Club in Florida was the first to cash in on the prize. Since Bowditch's ace, there's been another with a DS-77 at Sun 'N Lake. Pat Dell also made a hole-in-one with the DS-77, making him the third winner nationwide in the contest. Volvik representatives recently presented large novelty checks to both. This promotion ends June 30, 2015, so there's still plenty of time to win. You must pre-register at Volvik.com/hole-in-one and agree to the contest rules. After that, use the Volvik DS-77 golf ball and get a hole-in-one to receive $500.